Today, the Landrush Program Period for .コム, the first IDN TLD from Verisign, opens for anyone to register .コム domain names on a first come, first served basis through June 12, 2016. The Landrush Program Period provides businesses and individuals with the opportunity to register .コム domain names before they become generally available to the public on June 13, 2016. 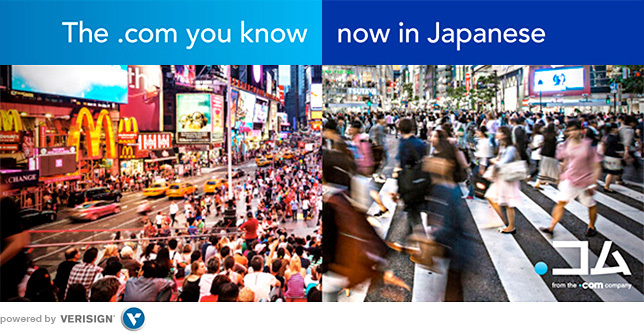 It is estimated that more than 90 percent of the population of Japan has access to the internet.1 By enabling Japanese internet users to navigate the web in their native scripts (.コム – the .com you know, now in Japanese), gives individuals and companies the ability to connect with audiences in their preferred language and maintain a common brand identity across multiple scripts. Millions of businesses and individuals around the world trust their websites to .com. Registering a .コム domain name is a powerful way to tailor your website to local customers with a domain name backed by Verisign. Don't miss your opportunity to connect with this important audience by registering your .コム domain name before someone else does. Review the list of registrars offering .コム to learn more about the availability and cost of your desired .コム domain names. For more information about .コム, click here. * Please note that the information in this blog post regarding the registration periods for .コム, including the corresponding dates, is for general information purposes only and is subject to change. For the most current registration periods, corresponding dates and other detailed information regarding .コム, visit newgtlds.icann.org/en/program-status/sunrise-claims-periods/xn--tckwe. List of participating registrars subject to change. Local Time: Friday, April 19, 2019 05:39 AM PDT – Page Load: 0.2591 Sec.